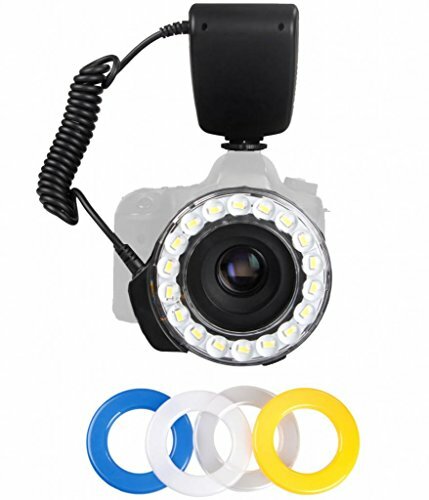 This Polaroid Super Bright Macro SMD LED Ring Flash & Light features 18 Super Bright SMD LED Beads which has double the power of regular LEDs and has a GN of 21. This attaches to most brand hot shoes and macro-capable lenses with mounting ring diameters between 49-77mm- 8 adapters are included with this package. The power pack attaches to the cameras hot shoe through which all synchronizing electrical signals travel. You can control the output level of the LEDs and select all or half of them to fire - 18 SMD LEDs for full lighting , 9 LEDs to create purposeful shadows on three dimensional subjects. You will also be able to change from flash firing mode to constant on. Constant on will let the camera decide which exposure is best and provide continuous light when using video cameras or the HD video mode in compatible digital cameras.